If you’re over a certain age, it’s all but impossible to think about hanging strands of twinkling Christmas lights on your house without picturing that iconic scene from National Lampoon’s Christmas Vacation: the rickety ladder, the staple gun, and the comedic falls. While this scene might be funny to watch, it is not so funny to actually experience. Maybe your lights are wadded into a big mass in your garage needing to be untangled first, just like the movie. If so we can’t help you there, but I do have a few helpful tips for how NOT to be a lampoon come twinkle-light season – and to keep your roof from being damaged. First and foremost, we do not recommend walking around on your roof for safety concerns. For example, don’t try climbing where the pitch of your roof is too steep just to get that perfect Santa placement. It’s not worth a broken leg or worse. In addition, you can damage your shingles with too much walking or moving things around up there. If you are determined to place lights on high peaks on your house, consider hiring a professional. Don’t lean your ladder on your gutters. It’s not safe for you or the gutters. If they break, you could go down. For another thing, don’t use a rickety ladder. If you’re considering trying to hang your lights and winging it without proper tools, you are in for frustration or injury. Check out all your lights and cords. You need UL approved extension cords specific for outdoor use and lights rated for indoor/outdoor use. Look at your packaging to see this information and how many strands to connect. Do not use any frayed or damaged cords. Check your lights before you string them up to make sure they’re intact and working – even if they are new. Take a look at what you have – or what you’re looking to buy – and make sure your lights all go together. LED lights, for example, have a slight bluish tint and will make incandescent lights look orange if put side by side. LED lights can save money on that electric bill come January, and you don’t have to worry about them overheating. They are definitely worth the money up front. Locate your power source. Newer homes tend to have one on the outside of the house, but older homes may not. This means you may have to run power through a window and need to plan accordingly. In either case, the location of your outlet will limit your design, so you want to keep that in mind. Use light clips. Do not hang Christmas lights with screws, nails or even a staple gun. Besides not being able to get them down easily, this is a huge hazard. Additionally, never attach anything to your shingles using nails or screws as this can cause leaks. Plastic light clips come in many different styles. They’re made to attach to your gutters or brick and can hold many different kinds of light strands. Some strands can even be purchased with light clips already attached. All-in-one clips can usually hold most kinds of lights depending on which way they’re flipped. Attach your light clips. If your strands don’t already have light clips attached, attach them on the ground before you climb the ladder. You don’t want to be fumbling with two hands up there while trying to stand balanced. Also, work with short sections of a strand at a time. Strands that are too long can be a hazard. Be careful. If you have incandescent bulbs, be careful not to hit the light strands on your house or ladder as you climb up. Bulbs can get damaged and put out a whole string. Also, an exposed bulb is a hazard in itself. 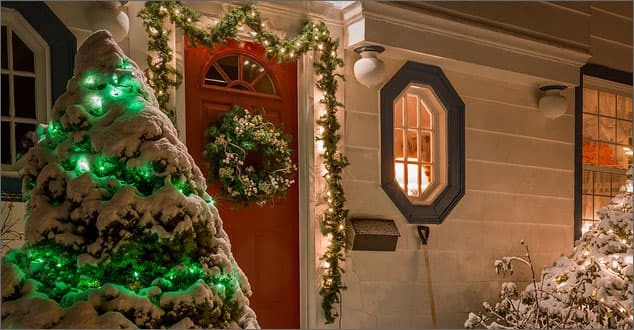 Hanging Christmas lights on your house can be a challenging project. With these helpful tips, you can be sure that your roof will not be damaged in the process, and that you will have a safe experience. Remember, if you have any roofing needs, we’re here whenever you need us!